From Goodreads: If you were told the date of your death, how would it shape your present? I firmly believe that some books find us at just the right time. And while literary fiction can be hit or miss for me, I absolutely adored this book. It's less about the prophecy and more about what choices these four uniquely different siblings make. The book is divided into sections, each focusing specifically on one sibling. I found myself crying in public after the first section and knew I was hooked. There were a few scenes throughout that were a BIT much for me (hello, sensitive reader) but overall I adored this book. I think Benjamin does a fantastic job bringing Varya, Daniel, Klara, and Simon to life and I truly savored my time with them. There were so many lines I found myself reading and re-reading, including the closing lines. I finished a few days ago and I'm still thinking about this story and the final pages. Overall, I found The Immortalists to be remarkable and absolutely captivating. It forced me to slow down to really soak in the beauty of the Gold family. I'm so glad I held onto this book for a few weeks before reading as it was the perfect way to kick off my reading in 2018. Already, it's found a spot on my favorite books list. This book is out in the world TODAY so do yourself and snag a copy. I hope you love it as much as I did. Thank you so much to Putnam Books for gifting me this early finished copy. All opinions my own. From Amazon: Ernt Allbright, a former POW, comes home from the Vietnam war a changed and volatile man. When he loses yet another job, he makes an impulsive decision: he will move his family north, to Alaska, where they will live off the grid in America’s last true frontier. Hannah does an incredible job of creating characters in such a way that they truly come alive in your mind while reading. I'm not sure that I've loved a character like Large Marge in such a long time. As much I hated so many of the choices the characters made at times, I felt like I knew them in such a way that I understood what they were doing, even if I loathed it. She took me to another world - Alaska in the 1970's. Beautiful, tragic, remote, and breathtaking. There's a significant story here but if domestic abuse and violence are triggers, this might not be for you. Hannah broaches a tough subject and handles it beautifully. My only complaint was something in the ending but I won't spoil that one for you. Overall, I really loved The Great Alone. It is so very different from The Nightingale so try not to compare - I won't lie, that was hard for me. I wasn't exactly satisfied with the ending but I still thought the book was incredibly well written. I was completely sucked into the story and stayed up late to keep reading. Bonus points for both making me laugh out loud AND tear up. 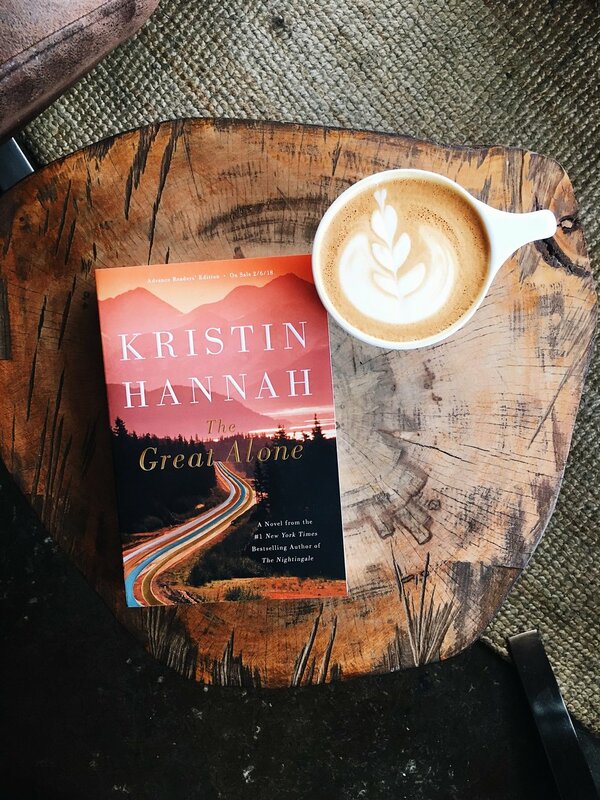 The Great Alone is out 2/6/2018. Pre-order your copy here. Thank you so much to St. Martin's Press for a free copy in exchange for a review. All opinions my own. What a year! I feel like I've heard the phrase, "The more things change, the more things stay the same" so often but it's never felt as true as it has this year. As much as things feel the same, I feel like 2017 has been a big year. While I read so many good books, the favorites truly were standouts. My favorites were Castle of Water, Beasts of Extraordinary Circumstance, and The Storied Life of A.J. Fikry. These books gave me ALL of the feelings. And when I say all, I mean all. I sat outside Whole Foods sobbing while finishing one of these and it was truly the best. I have had the most fun reading this year and am already eyeing my bookshelves to see what I want to get 2018 started with. I've loved connecting with so many people over a shared love of reading. It's been a hard but beautiful year and I think those are some of the very best kind. What was the best book you read this year?! Maybe it's a millennial thing but I feel like I've been hearing about bullet journals (or #bujos if you're on the internet) for so long now. The idea (in my own words) is that it's a place for all of your lists, goals, and ideas to be in one place. I have friends who are far more artsy than I who use it as a bit of a catch-all. Theirs are full of lists but also memories, photos, and quotes. I loved it but didn't think it was for me - it seemed like a lot to keep up with. I started tracking what books I was reading in 2013 and have kept a notebook specifically for my lists since. I knew that I loved tracking bookish things and figured that would be something I could actually keep up with. I followed my friends' lead and bought a leughtturm1917. This is the one I have - I love how bright the yellow is! Now, I had space to track not just what I'd actually read but keep lists and organizers of other things - books I wanted to get through, how many fiction vs. non I've read in a year, etc. I don't feel like there's a ton out there in relation to bookish spreads specifically, so I'm hoping that as more people start using a bullet journal for books, we can all share ideas. I absolutely love it! All of my bookish things are in one place and it's an excuse for my washi tape addiction. I personally love using felt tip pens. These are my favorite - I love the size small! And the mildliners come in the very best colors. I'm learning as I go but I've loved having another creative outlet for all things books. Can't wait to see what you come up with and make sure to use #bujoforbooklovers so we can see! Happy reading and bullet journaling.